Watch the premiere episode of the Disney Channel's upcoming new series. Hey, look! Asians on TV! 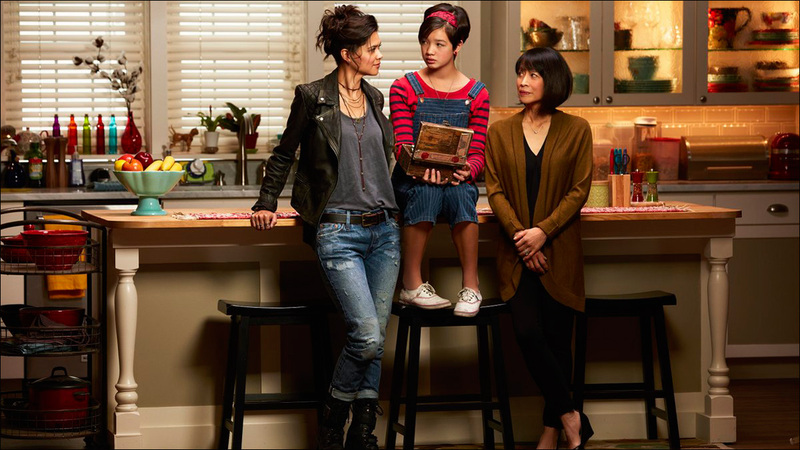 Andi Mack, the highly-anticipated new Disney Channel series from the creator of Lizzie McGuire, adds to the growing tally of Asian American families on television, with a great cast that includes Peyton Elizabeth Lee, Lilan Bowden and Lauren Tom. But after the watching the wonderful premiere episode, which is now available in its entirety online, it's pretty clear that this is unlike any Asian American family we've seen on TV before. I loved it. The coming-of-age series centers around Andi (Lee) as she's about to celebrate her 13th birthday. However, when her adventurous, motorcycle-riding older sister Bex (Bowden) returns home with the hope of getting her life together, Andi's life is turned upside down and she is left questioning everything she's ever known. The performances -- particularly from Lee and Bowden -- are charming as hell and the writing is sharp. Sure, this is a youth-oriented show, and a few of the zingy one-liners. wise-cracking best friends and boy-crush subplot all reflect that. And yes, it's noteworthy that the show centers on a biracial Asian American family. But ultimately, the driving force of the story is the atomic reveal that gets dropped in the middle of the premiere. Andi Mack premieres April 7 on The Disney Channel.